Two of the biggest names in the NHL trade market were finally dealt last week. The Senators shipped defenseman Erik Karlsson to the Sharks while the Canadiens traded left wing Max Pacioretty to the Golden Knights. With Karlsson and Pacioretty off the block, Blue Jackets left wing Artemi Panarin and goaltender Sergei Bobrovsky could become fodder for trade gossip. They’re both eligible to become unrestricted free agents next July and face uncertain futures in Columbus. Panarin was their leading scorer last season, tallying 82 points in 81 games. Bobrovsky, meanwhile, is a two-time Vezina Trophy winner as the NHL’s top goaltender. They’re crucial to their Stanley Cup aspirations. Earlier this summer, Panarin expressed reluctance to sign an extension with the Blue Jackets. He also indicated he would not longer discuss contract issues once training camp opened Sept. 13. The Athletic’s Aaron Portzline reports the Panarin camp hoped that deadline might force the Jackets into finding a trade partner their client would be willing to sign with. General manager Jarmo Kekalainen, however, was unfazed. “There no such deadline in my book,” he said, citing Panarin’s eligibility for UFA status July 1 as the only one he recognized. Nevertheless, Kekalainen maintains he has a great relationship with Panarin and his agent. Earlier this summer, reports suggested Kekalainen received some trade proposals for Panarin. However, the offers lacked a player who could offset the winger’s departure. The Boston Globe’s Kevin Paul Dupont wonders how much it would cost the Bruins to bring in Panarin. He notes they have sufficient room to absorb his $6 million salary cap hit for this season and the depth in young players and prospects to entice the Jackets. Dupont also points out it’s uncertain if Panarin would re-sign with the Bruins. He also thinks Kekalainen’s asking price might include young forwards Jake DeBrusk and Ryan Donato. Bobrovsky appears the more willing of the two to re-sign with the Jackets. It’s believed he’s seeking something comparable to that of Carey Price, who’s earning an annual average salary of $10.5 million on an eight-year contract with the Canadiens. Bobrovsky’s two Vezina Trophies carry weight in negotiations, but his stellar regular-season play tends to disappear in the playoffs. That might explain the Jackets’ reluctance to pay him Price money. 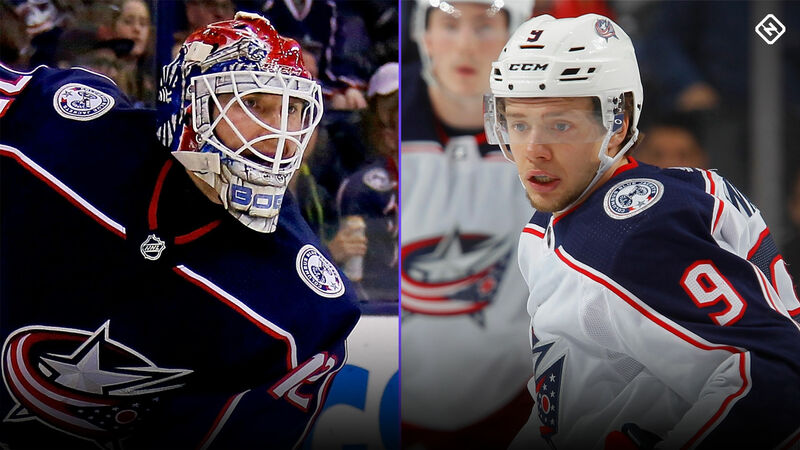 As long as the Jackets remain playoff contenders this season, Panarin and Bobrovsky won’t be going anywhere. Kekalainen will likely keep trying to keep them in the fold. Should the Jackets fall out of postseason contention in February, however, he might be willing to entertain trade offers. Expectations are low for the Canucks this season. The club is in the midst of rebuilding with younger talent, led by center Bo Horvat, winger Brock Boeser and promising forward Elias Pettersson. They’re not expected to be among the playoff contenders. That’s generating questions over the futures of veteran defensemen Alexander Edler and Michael Del Zotto, who are slated to become unrestricted free agents next July. During a recent mailbag segment with his readers, The Athletic’s JD Burke was asked about the likelihood of one or both blueliners getting shopped by the Feb. 25 trade deadline. Burke believes Edler, who last season reached the 30-point plateau for the sixth time in his career, would fetch a better return than Del Zotto. However, that depends on the 32-year-old’s willingness to waive his no-trade clause. Burke doubts Edler will sign a contract extension with the rebuilding Canucks, who’ve yet to approach him about a trade. However, colleague Jason Brough subsequently reported the blueliner isn’t ruling out staying in Vancouver beyond this season. Still, he declined to say if he’d waive his movement clause if asked by management to do so. Chris Tanev also frequently surfaced last season in trade chatter. Jason Botchford reported injuries affected the 28-year-old’s trade value. He said offers were “surprisingly weak” because interested clubs were concerned over Tanev’s ability to finish a season. Interest in Edler and Tanev should increase once the calendar flips to 2019, though their respective no-trade clauses will factor into possible destinations. Del Zotto’s puck-moving skills could also attract some attention. Who is Dave Brailsford, what’s Team Sky manager’s ‘marginal good points’ philosophy and what did he say about Bradley Wiggins controversy?